Dinosaurs! You love ’em, I love ’em, everybody loves ’em — and we love ’em even more when they look cheap. 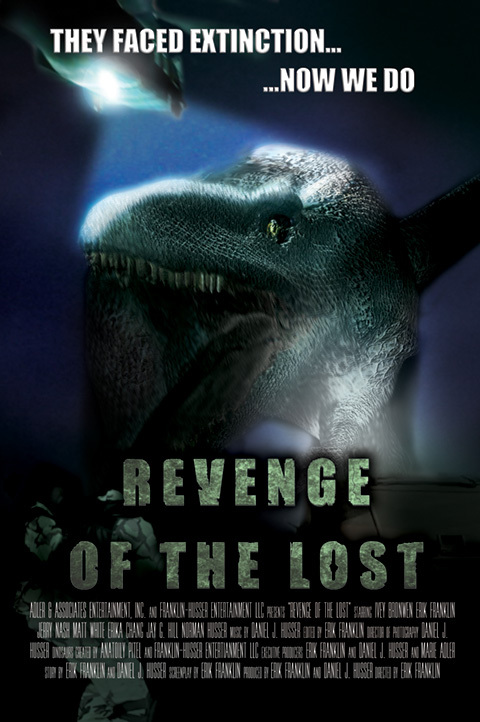 The good news is that if you’ve got a low-rent dinosaur itch, there’s a brand-new (2017 release date and all) number available for streaming on Amazon Prime called Revenge Of The Lost that’s sure to scratch it for you. The bad news is that aside from the admirably cheesy practical-effects dinos, it’s not a flick that really has much else going for it. The brainchild of director/co-writer/producer/star Erik Franklin and co-writer/producer Daniel Husser’s less-than-imaginatively named Franklin-Husser Entertainment, a Seattle-based production outfit that apparently has some ambitious plans for the future, this is a film that fell far short of its fundraising goal on Indiegogo, but what the hell — our intrepid Pacific Northwest auteurs didn’t let that stop ’em from unleashing their debut opus on the world, and for that “never say die” attitude alone they get some solid “props” in my book. Labors of love such as this are definitely the kind of thing I have a vested rooting interest in, but much as I’d love to, I can’t completely shut off all of my (limited, according to some) critical faculties and just heap praise on all aspects of a production that has some serious — and frankly glaring — flaws. So keep in mind, as you read on, that any and all criticism I level at this film comes from a place of — well, maybe not love, but at least like. 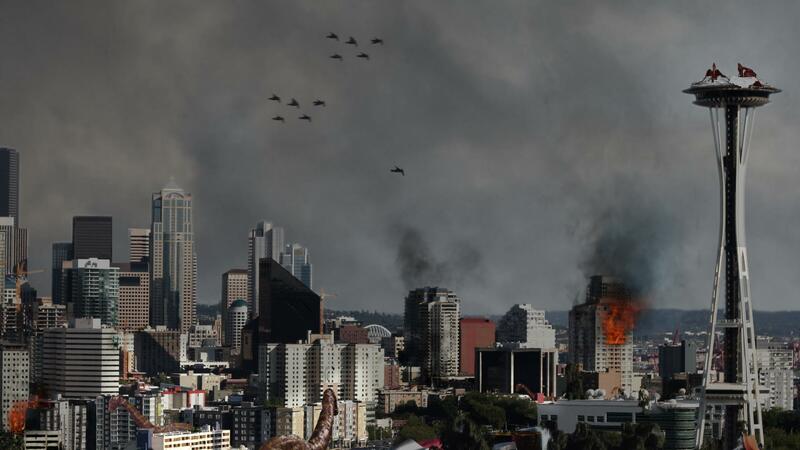 Here are the basics : right out of nowhere, the dinosaur apocalypse lands on the hipster capital of America, but fear not — there’s a military base nearby that you can hole up in to ride out the mess, provided you can make it there in one piece. So guess where our trio of largely personality-free protagonists — Michelle (played by Ivey Bronwen), Jeremy (Jerry Nash), and Ray (Franklin) — are headed? Oh, sure, they’ll briefly make the acquaintance of some mostly- reluctant temporary allies, as well as some folks who fall well short of that description, along the way, but mostly you know that what you’re going to end up with here is a closed-set, small-cast movie that sees our “heroes” struggling to survive against insurmountable odds in a warehouse made up to look like a high-security armed forces installation. And so you do. 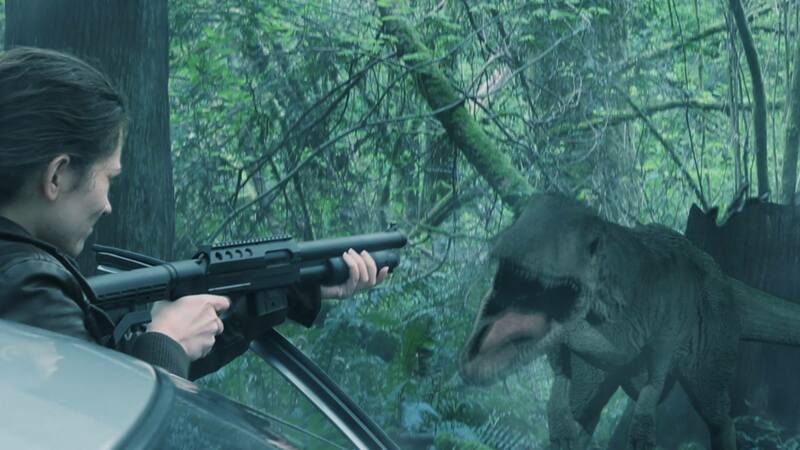 Franklin and Nusser clearly can’t afford to surprise you on their micro-budget, pretty much all of which was of necessity blown on their numerous model dinosaurs, but without actors that can at least get you to care about whether or not they make it out alive — well, you won’t care whether or not they make it out alive. I got a good, old-fashioned “B”-movie charge every time a big, green, hungry reptile showed up on screen, but when there weren’t any around, my interest waned pretty damn fast. The film tries its best to maintain your interest with a lame “who’s really behind all this and why?” sub-plot, but it’s amazingly predictable stuff that doesn’t — maybe even can’t — do what it needs to in terms of holding on to your attention by its finger-tips. Bless ’em for giving it the old college (or at least film school) try, but actually succeeding would be even better. Still, I can’t say Revenge Of The Lost isn’t worth at least one watch (though probably no more) for fans of ultra-low-budget creature features. 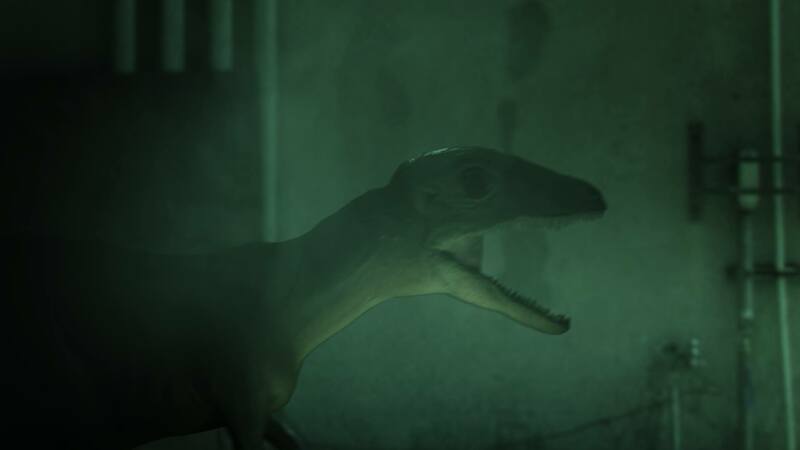 I admire the fact that Franklin and Nusser only rely on crap CGI when they absolutely have no other alternatives, and keep things old-school as much as humanly (or reptilian-ly) possible. If a little bit more time, attention, and thought had been put into what the hell they were going to do to to keep things chugging along when there were no monsters on-screen that would have been welcome, sure, but when they do put in their various and sundry appearances, this is fun enough stuff — even if purely by default — to make you think that somewhere Sid and Marty Krofft are probably smiling at the efforts of their spiritual successors.